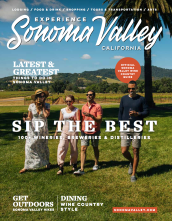 A year-round destination, Sonoma Valley is home to more than 100 premium wineries, a variety of lodging options ranging from luxury hotels to charming bed and breakfasts, award-winning olive oil producers, breweries, artisan shopping, delicious dining, 13,000 acres of state and regional parks, world-class spas and endless discovery. The town of Sonoma is the birthplace of the state of California, as well as the state’s wine industry and Sonoma Valley is home to the state’s oldest commercial and family-run wineries. MacArthur Place Hotel & Spa: Established in 1869 as the private estate for David Burris, a veteran of the Mexican American War, miner, rancher and founder of Sonoma’s first bank, MacArthur Place Hotel & Spa will complete an extensive renovation this March to restore and enhance the site’s original farmhouse charm. The 64-room hotel will unveil newly-furnished architecture, landscaping, technology, signage and branding as well as a wholly-reimagined food and beverage program consisting of three beautiful new outlets, all under the direction of lauded Executive Chef, Cole Dickinson and in partnership with Celebrity Chef Geoffrey Zakarian. New culinary offerings include Layla, an inspired Mediterranean fine dining experience, The Bar at MacArthur, serving American fare and craft cocktails, and The Porch, an open-air coffee shop and all-day stockhouse. Cave Tastings at Kunde Family Winery: For more than a century, five generations of the Kunde family have farmed the lands of the 1,850 acre Kunde estate in the heart of Sonoma Valley. Through the end of March, Kunde Family Winery is offering visitors a new way to taste the vineyard’s estate-grown, sustainably farmed wines with the Seated Cave Tasting Experience. Set amongst the vineyard’s aging caves, the tasting’s intimate setting is carved into the volcanic hillside at the farthest reaches of the Kunde caves. Led by an expert wine educator, guests will enjoy a barrel sample along with an in-depth tasting of winery exclusive and reserve tier wines. The new offering is available Thursday through Sunday through the end of March at either 12 p.m. or 3 p.m.
Public Kitchen: The former Park 121 Café & Grill, located in the Carneros Corridor at Cornerstone Sonoma, has rebranded under new ownership as Public Kitchen. The café’s menu continues to serve the favorites, showcasing their 25-year tradition of utilizing local purveyors throughout Sonoma, Napa and Marin counties. The eatery’s dishes are offered al fresco in a relaxed garden setting and indoors. Prohibition Spirits Distillery Peat-Smoked Brandy: Prohibition Spirits Distillery, an artisanal, small-batch distillery in the heart of Sonoma Valley has released its newest artisan Chauvet Brandy, VSOP. Distilled from locally sourced Pinot Noir grapes, the new brandy gets its distinct flavor from being aged in French oak wine barrels that have been smoked with Peat from Islay, Scotland using a proprietary cold smoke technology. The result is a first-of-its-kind brandy that breaks from the traditional perception and profile with a fruit-forward start, sweet mid-palate and mild smoky and peaty notes finish. This exhibition, part of Phillip K. Smith’s ongoing Lightworks series, investigates the relationship of color, form, surface and change. Smith views each Portal as a highly specific three-dimensional canvas that he paints with light over time. Each work evokes a sense of breath with careful color selection, location and more. Using color to alter the spatial experience from Portal to Portal, at times the viewer will experience a sense of pushing away from or pulling towards the wall. Additionally, each Portal is meant to adapt to the space in which it is shown, merging with the changing ambient light of the gallery. By day, the colors merge with the sunlight, creating more pastel light and shadow relationships, while at night, the colors saturate appearing to hover as the envelope the surrounding space. Introducing the recent works from Bay Area ceramicists Richard Shaw and Wanxin Zhang, this exhibit focuses on the pair’s explorations of the cultural exchange between China and the West. Although the two men are a generation apart and their work differs stylistically, their message and means are similar: both use humor and satire in seamless reference to global history, popular culture, and personal experience in their revolutionary works in clay. This exhibition will celebrate the remarkable artistic legacy of Sonoma County through the works of historic and contemporary artists who have lived and worked in the county. Works by Chester Arnold, Jane Baldwin, Fletcher Benton, David Best and Bernice Bing, amongst others will be included in this memorable exhibit. 50th Anniversary of Sonoma Raceway: During the 2019 race season, Sonoma Raceway, Sonoma Valley’s year-round motorsports complex offering one of the most comprehensive race schedules in the country, will host a full schedule of on-track activities celebrating 50 years of racing. As part of the festivities, late last year the raceway introduced a 50th anniversary logo, which includes a nod to the raceway’s signature Sears Point Raceway emblem, that will be used prominently throughout the season. Honoring the raceway&apos;s history and memorable moments will be at the heart of the raceway&apos;s efforts this year, including celebrations to mark significant milestones in the raceway&apos;s history, festivities at the raceway&apos;s major events featuring drivers and legends, and plenty of throwback images and memorabilia. In addition to special events, the raceway is encouraging fans to reminisce on their personal memories, stories and pictures from Sonoma Raceway by sharing them at www.sonomaraceway.com/50 or on social media using the hashtag #Race50noma. Anniversary of Jim Bundschu’s Return to Rhinefarm Vineyards: Fifty years ago, in 1969 Jim Bundschu of the Gundlach Bundschu Winery family began the four-year project of fully replanting the family vineyard with premium varietal wine grapes following its closure in 1933 due to Prohibition. This historic moment for California’s oldest continuously family-owned winery, which began in 1858, marked the resurrection of the historic winery and the return of the family’s legacy in making world-class wines. Today, Bundschu still maintains his connection to the family business by living in the stone house constructed in 1906 that overlooks the vineyard. It’s not uncommon for visitors to spot him out in the vineyards farming grapes. Basque Boulangerie Celebrates 25 Years: Basque Boulangerie, one of Sonoma Valley’s most beloved bakeries, originally opened its doors on the historic Sonoma Plaza in 1994. Celebrating 25 years, the bakery continues to provide locals and visitors with the old-world feeling of an original French bakery. Founded by a family from the southwest region of France who learned the baking trade in the small French towns of Saint Etienne de Baigorry and Oloron Sainte Marie, Basque Boulangerie celebrated the big anniversary with 25 cent specials for locals across a week-long celebration. Sonoma Speed Festival: The inaugural Sonoma Speed Festival, held Thursday, May 30 through Sunday, June 2 at Sonoma Raceway, will combine an impressive lineup of vintage racing cars for a celebration of flat-out wheel-to-wheel racing. Reliving the “golden days” of racing, onlookers will be able to watch iconic racing cars zoom past the sweeping hills and curves of the classic Wine Country circuit throughout the weekend. In addition to the races, visitors can explore the historic and cultural Evolution of Speed exhibit in the raceways paddock. Throughout the weekend, Brass Era to contemporary racing vehicles will be featured within the exhibit alongside displays of vintage dragsters, concepts, prototypes and other special displays. The raceway’s food park will feature bites from local restaurants, wine, beer and coffee for all to enjoy. Blancpain GT World Challenge America Series: Presented by SRO Motorsports Group, the new Blancpain GT World Challenge will present GT3 manufacturers, partners and teams the opportunity to compete in a worldwide custom racing championship, landing at Sonoma Raceway for the first-time June 7-9. New Airline Lift: Making it even easier to experience the beauty of Sonoma Valley, Charles M. Schulz Sonoma County Airport will continue to expand this year with two new direct flights from major hubs Denver and Dallas launching this year. Beginning March 8, United Airlines will begin direct flights to and from Denver. American Airlines will join Alaska Airlines with direct flights from Los Angeles starting May 3. Later this summer, launching on June 6, American Airlines will also add daily service to and from Dallas-Fort Worth. The airport is also currently evaluating proposed plans for a major expansion of the terminal that would triple its size. First Sustainable Wine Region: This year, the Sonoma County Winegrowers Association hopes to make Sonoma the first fully certified sustainable wine region in the nation. With support of the Sonoma Valley Vintners & Growers Association, the initiative will ensure businesses, rural lifestyle and agricultural heritage will be maintained for years to come. As Sonoma Valley continuously works to stay on the cutting edge of sustainability practices, the local forum, Sustainable Sonoma, is a diverse group of Sonoma Valley leaders representing businesses, environment, social justice, nonprofits and government take action on solutions to the community’s biggest challenges.